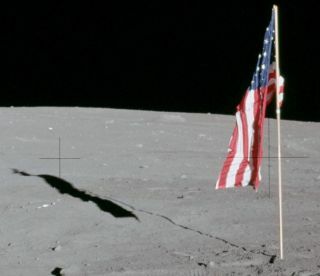 Detail from an Apollo 12 photo showing the deployed flag and its shadow. The latch failed on the pivot designed to hold the top edge of the flag out perpendicular to the pole on a supporting rod, so the flag hung limp. The photo was taken Nov. 19, 1969. How does a country preserve its mark on the moon for decades to come? It may not seem like the moon is a busy space-traffic hub these days, but in the not-too-distant future, that could change. On Sunday (Dec. 1), China launched a spacecraft designed to land safely on the lunar surface, and some private companies hope to stage launches to the moon as well. If industry and other nations aren't careful, the uptick in lunar traffic might disturb the landing sites from the Apollo era, as well as Russia's landing sites on the lunar surface. "They [lawmakers] tried to carefully say it wouldn't violate the treaty's sovereignty issues," Henry Hertzfeld of the Space Policy Institute at George Washington University said. "First of all, I think it does, but secondly, even if it doesn't, other nations, including our friends and allies, are going to look at that and say, 'They're declaring sovereignty and violating the treaty.' It's going to be interpreted as yet another aggressive U.S. action." In a new paper published in the journal Science on Thursday (Nov. 28), Hertzfeld details a potentially better way to preserve the lunar landing sites of nations who have landed on the moon in the past, and those that hope to do so in the future. Instead of a nation-specific approach to lunar heritage, Hertzfeld and his co-author Scott Pace propose that government officials open lines of dialogue among nations to establish ground rules for how to best maintain every country's mark on the face of the moon. "The idea is, you leave our stuff alone, we'll leave your stuff alone," Hertzfeld told SPACE.com. "I'm trying not to focus on property rights or specific equipment. I'm just trying to say, at least, for an easy start, to protect what's there, you take every precaution not to mess around with what we have, and we'll do the same thing." While the United States and other nations already have lines of communication set up to discuss space matters, sometimes issues still arise. NASA's newest moon probe, the Lunar Atmosphere and Dust Environment Explorer (LADEE for short), might run into some issues when China's Chang'e 3 lander touches down on the moon, kicking up dust that could interfere with LADEE's science. Hertzfeld's international approach might even help ease strained relations between the United States and its fellow spacefaring nations like China and Russia. "If successful, this type of agreement, besides protecting the lunar artifacts, could also help to thaw some of those relationships," Hertzfeld said. "Anybody that would go up in a private company would need a license of some sort from their governments, even if it's just a launch license," Hertzfeld said. "It's really, for the most part, not a private industry question but a government question." NASA is already working toward protecting its sites and instrumentation on the moon. In 2011, NASA took steps to make sure that the private groups participating in the Google Lunar X Prize — a $30 million prize going to the first company to land and perform certain tasks on the moon — don't damage the space agency's equipment on the moon, some of which is still gathering science data.